The MLS Players contract expires today. We will be posting updates as information becomes available. Keep your fingers crossed. Former New York MetroStars coach Octavio Zambrano recalls how then general manager and CEO of the MetroStars and current Philadelphia Union CEO Nick Sakiewicz gave him full responsibility on player personnel. 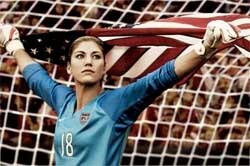 Hope Solo saves two penalty kicks in the USWNT 2-0 victory over Iceland in team’s first match of the Algarve Cup. The US is now top of Group B. After reading PSP’s Ben Tracy’s wrap up of the US v El Salvador match, you can look the player ratings at goal.com. Stuart Holden makes his Bolton debut in 0-4 loss to Tottenham in the FA Cup. FIFA will require most leagues to use a new online transfer register later this year in an effort to control the $1 billion international transfer market. In a reverse from yesterday’s news, Wayne Bridge says that his position on the England squad is “untenable and potentially divisive” and has ruled himself out of selection for England’s World Cup squad. Note to the US – attack down the left. Six employees of the bar in which Paraguayan striker Salvador Cabanas was shot in the head have been charged with covering up for the suspected shooter, a fellow employee. The suspect remains at large. In Europa League action, Galatasaray face Atletico Madrid at 1 p.m. and at 3 p.m. Juventus host Ajax. Both matches are on GolTV. If you missed the USA v El Salvador match you can watch a replay on ESPN360.com. Liverpool’s Europa League campaign begins today against Unirea Urziceni. The surprise champions of the Romanian league made a good showing in the Champions League group stage, finishing in third place and only one point behind Stuttgart.